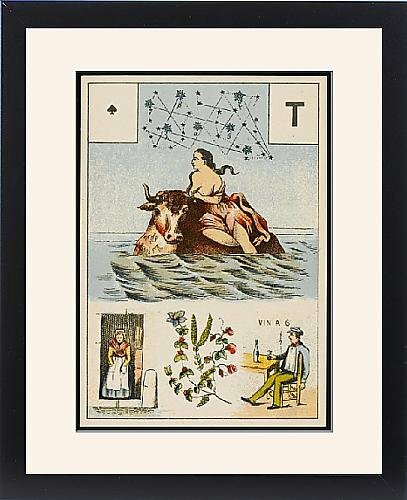 Framed Print Of Lenormand - Europa by Prints Prints Prints at UtopyaCon. MPN: s27_607178_6989_461. Hurry! Limited time offer. Offer valid only while supplies last. FRAMED PRINT. 22x18 inch (56x46cm) Framed Print with Black Satin with Off-White Digital Mat. Artwork depicting LENORMAND - EUROPA. GRAND JEU DE MLLE. FRAMED PRINT. 22x18 inch (56x46cm) Framed Print with Black Satin with Off-White Digital Mat. Artwork depicting LENORMAND - EUROPA. GRAND JEU DE MLLE. DE LENORMAND EUROPA. Professionally made to order in the USA. Artwork Description... Grand Jeu De Mlle. De Lenormand Europa.